In Vegas the lights are hypnotizing, the music makes your blood pump and the riveting nightlife creates intense heartbeats. Sorry to spoil the fun but water damage can make its way into your home, instantly taking away your good time. Why take a gamble by not calling our water damage Las Vegas team immediately? Take off your pumps and fedora for just a second and pick up that phone. 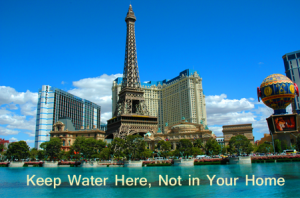 You may be enthralled by the glitz and glam of Vegas but water damage issues are still paramount. If dancing around in the club is your scene, more likely than not you dance at home. Whether it be in front of the mirror or with your friends, a dry floor is necessary for the dance party to get started. One little leak is all it takes for water damage to become problematic in your home. Luckily our water damage Las Vegas experts are fully prepared to handle all water extractions. If you want to get movin’ and groovin’, shake your rump all the way to the phone and give our team a call. Some people peruse the casinos for a good gamble while others sit in their soaking wet home gambling away money. The sooner you dry up those floors with our trusted technicians, the sooner you can hit the casino. There are many things you can gamble in Las Vegas but your home should not be one of them. Water from a burst pipe or toilet overflow contains serious bacteria and once it hits the floor, it’s downhill from there. Mold will quickly form and your health becomes jeopardized. If you bought a new outfit so you could look like a celebrity under the disco, think again. Let our mold removal experts take care you. Do you really want to be the sick guy on the dance floor? Probably not. Our water damage restoration services are very quick! How quick? Well, we respond in 45 minutes and offer same day services. The longer you sit and wait, the more water will permeate into your floor. It’s better to miss one night gambling on the Vegas Strip, rather than an entire week. Once you let water damage pour into your house, repairing damages becomes more costly. Feel free to call us today if you are suffering from a water damage emergency!